When I introduce someone new to OpenStreetMap I often get asked how is it different from alternatives, such as Google Maps. One of the key differences is that our map data is supplied and incorporated by 1000s of volunteers, each one passionate about their local community or area of expertise. This means that our data is often rich in local knowledge, and is also frequently updated (as seen in speed by which the Humanitarian OpenStreetMap Team respond to changes caused natural disasters). All this map data is fantastic, but if you cannot present it in the way you require, then you might as well not have it in the first place. This leads me to a second difference between OSM and other alternatives; namely all the underlying data is available to download and use for free. If you are not happy with the way the map looks, then you can you can use the data to create your own map. In this blog post, I introduce one such tool – Maperitive. “Maperitive is a desktop application that renders maps in real time using OSM and other sources of data.” In essence we provide Maperitive with raw map data and a set of instructions describing how we would like the data to be displayed, and it draws (or renders) us a map. Question: How to download and install? There is no installation process as such. Simply download the latest version of the Maperitive zip file from http://maperitive.net/download/, unzip it into a directory of your choosing, and run it by double-click on maperitive.exe. (For non-Windows OS’s installation instructions can be found here). Question: I’ve downloaded and opened Maperitive, what am I looking at? The user interface for Maperitive comprises of 4 parts. The majority of the window is taken up by the Map Area. By default this will be showing the standard OSM Map, or “Web Map” as can be seen in the Map Sources list in the bottom right hand corner. As we add more data this will appear in this list. The map can be moved by clicking and dragging, and zoomed by pressing the + and – keyboard keys (or using a mouse scroll-wheel). At the top is the Menu Bar with drop down menus (File, View, etc..). Finally, in the bottom left is the Commander. Here we can enter instructions in the command prompt, however to keep things simple, we will only be using the Menu Bar to issue instructions in this blog post. Question: How do I render my own map? Before we can render a map, we must first get some map data. There are many ways to get OpenStreetMap data (we will explore these in a later blog post), including through Maperitive itself. For now we will use the OpenStreetMap.org website. Load the website and move to an area you are interested in. To download the data simply click “Export” and select “OpenStreetMap XML Data” as the download format. 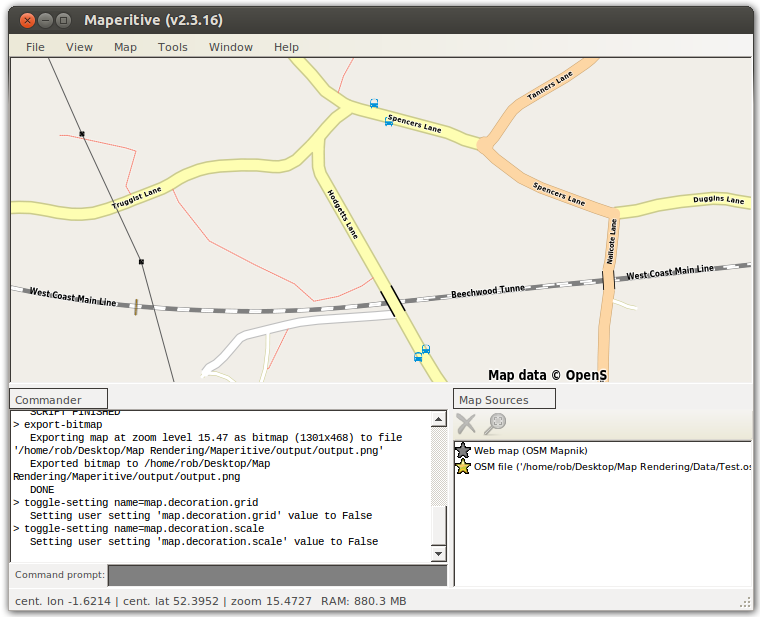 Once you have downloaded some OSM data lets get Maperitive to render it. Start by clicking the star next to “Web Map” in the Map Sources list. This switches off the default map and the Map Areashould become a blank canvas ready for us to render a map. To do this open the downloaded map data using File->Open Map Sources…. Congratulations you have rendered your first map! By default the map will look very similar to the standard OSM map. We can however change this by selecting a different set of “rendering rules”. Try the different rules by selecting them using Map->Switch To Rules. In a following blog post we will explore how to create your own rendering rules, and therefore customise your map to your liking. But for now lets finish by exporting the map to a PNG image. Choose Tools->Export To Bitmap. The location in which the image file was saved is shown at the bottom left, as the final line in the Commander. 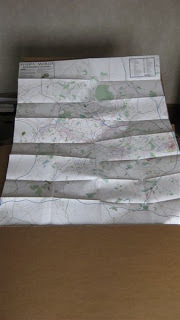 After a steep learning curve with Maperitive and OpenLayers there’s a map of allotments in the West Midlands available here. It’s still rough around the edges but it forms the basis for further development (such as pop-ups with more data). I only really cracked the techniques involved when I discovered Ed Loach’s wiki page. Thanks Ed! I hope people find it useful. 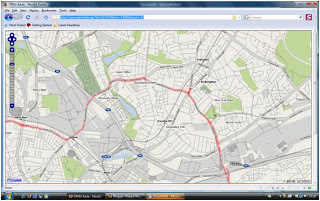 The map is restricted to the West Midlands because we wanted to work with a data set that was almost 100% complete. The data comes from web pages listing allotment sites published by the 7 local authorities in the West Midlands (Dudley, Sandwell, Walsall, Wolverhampton, Birmingham, Solihull, Coventry). We didn’t hit 100% as there were 14 allotment sites that either couldn’t be located or had other data quality issues. They are listed on a mappa-mercia wiki page and any help in resolving the issues listed would be welcome. A word of praise here for Birmingham City Council who were able to answer a question about the location of a very small 3 plot redundant site which was at the back of some houses within 2 minutes of contacting their call centre – very impressive. Whilst editing the allotment sites, aerial imagery also showed up other sites which are privately-run and not run by a local Authority, so our map and underlying dataset shows a more accurate picture that what can be gained just from local authority listings. Even now we might not have located all the privately-owned and run sites – any help or information will be greatly appreciated. Sadly we were not able to gather via this route the information we set out to obtain for the Allotment Data project which was waiting list data. Local Authorities do not generally hold this data: this is maintained by each allotment site association. This will require either a concerted phone campaign or volunteered information as and when (and if) people see value in this map. As a result of this work, we discovered the work being done by the New Optimists Forum on food security, and inspired similar work to complete allotment data for Warwickshire. Keep going Andrew! Mapping data on a themed basis like this opens up all kinds of interesting and linked information and also helps to make contacts and connections with owners and users of the data. Highly recommended for online community building! Heart of England Way completely mapped! On Sunday I completed a short 4Km stretch around Blockley, the last remaining gap in the OSM map. Thanks are due to everyone who contributed over the years, collaborating in mapping this long distance route. The Heart of England Way stretches for some 100 miles through England’s Midlands. This route proves that the Midlands does not justify its image of an industrial wasteland. The Way starts in Staffordshire’s heathlands and forest on Cannock Chase and passes through the small city of Lichfield with its three-spired cathedral known as the “Mother of the Midlands”. It then passes between the industrial giants of Coventry and Birmingham, although with the peaceful countryside it chooses, you wouldn’t know they were there. Rural Warwickshire beckons as the Way meanders through the remains of the Forest of Arden. The final part sees it sharing much of its route with the Monarch’s Way as it leapfrogs from one cosy Cotswold village to another. It finally ends up in the tourist honey-pot of Bourton-on-the-Water, where it links with the Cotswold Way. The most popular Guide to the Way by Richard Sale has the route going the other way, but describing it this way reflects more the order in which we mapped it. Let’s hope Sandwell and Dudley release their data soon. With the cold weather continuing its been difficult to get out and do the normal level of new mapping so we decided at one of the monthly social meets to do a bit of work that didn’t require much outdoor mapping. Gritting Routes. Birmingham City Council like many other local authorities publish their winter road management plans, including those routes which are strategically important and therefore should be kept clear of snow and ice in the winter. These gritting routes have been added to the OpenStreetMap.org database and a new overlay created from this to add a gritting map to mappa-mercia.org. Solihull has since been added and we are hopeful to add the other West Midlands LA’s data soon too. The work hasn’t stopped at gritting routes. 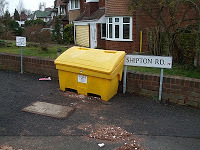 The location of grit bins, placed by LA’s at vulnerable locations such as steep hills and schools, especially on roads which are not routinely gritted, needs to be located or verified on the ground. We’ve started to add some to the database and now show on the gritting map when you zoom in and more will appear as they are found and verified. If you have a grit bin on your street why not add it yourself or tells where it is and we will add it for you. Great work to all those who have contributed. Well I’m well and truly hooked on entering bus routes as relations now I’ve discovered a cool German website that renders bus routes (and all other forms of surface public transport routes). Click here for a browse around. Two minor problems so far – one, the site’s in German for the map legend but the rendering is great; and two, new edits only appear at zoom level 13 so you look at a bigger map and you only see older edits (don’t know yet what frequency these levels are rendered at, but at level 13 it’s done on a daily basis). The only bus stops that currently get rendered are those with a name tag. So… I’ve entered lots in SE Birmingham, but avoided the City Centre terminations so far. I’d appreciate some help from the folks in Coventry to get route 900 completed. Anyway the big achievement is to get the whole of the route 11 completed. And no, I haven’t entered two relations one for the clockwise 11C and one for the anticlockwise 11A! It was enough work just doing it once. 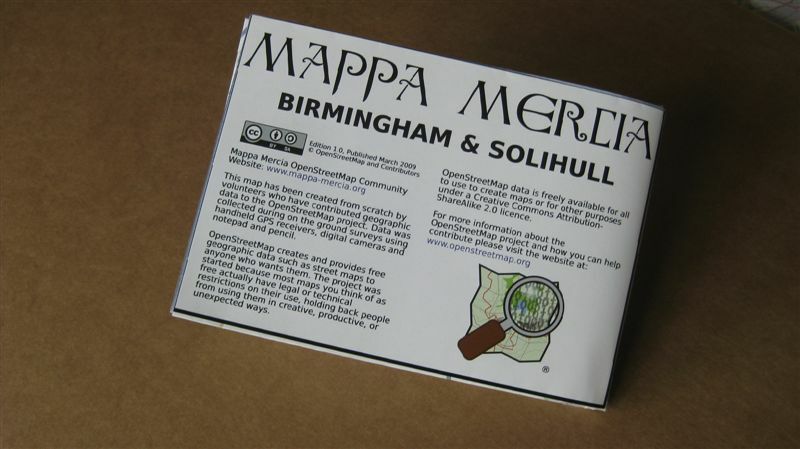 Today we received our batch of 50 limited edition prints of the new Mappa Mercia Birmingham and Solihull map built from the ground up by the OpenStreetMap community in the West Midlands. 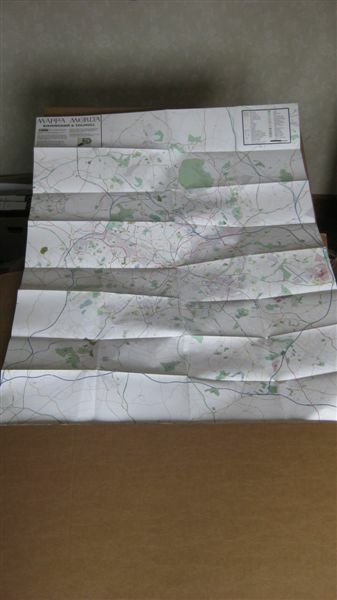 This is the first edition printed on A0 poster paper and then folded to create a traditional folded map. 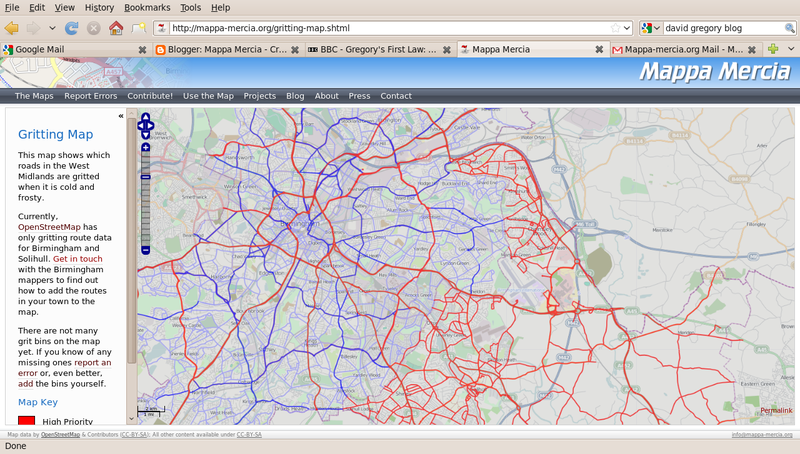 Coverage is the whole of Birmingham and Solihull right out to the Motorways. Matt Amos at Cloudmade kindly created one large PDF from Mapnik. The level of detail is basically that seen on the OpenStreetMap zoom 14 Mapnik layer. However the printers needed it in CYKM and our PDF was RGB so we rasterised the map at 300dpi to create a compressed TIFF without loosing any resolution at the printed size. 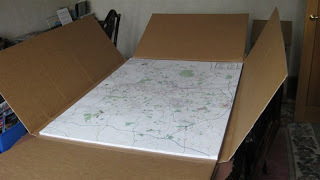 The maps will be folded and numbered. Some will be given to the main contributors in Birmingham and the plan is that the rest will be sold to cover the cost of printing or in some cases used for promotional purposes.